Our True Range Oscillator is one of many proprietary analysis tools available only in our software. The True Range Oscillator was inspired by the work of Jack Schwager, author of the best selling Market Wizards. True range is the basis of the oscillator and is used in DMI and William's AD calculations, among others. It is defined as the true high - the true low, where the true high is the maximum of today's high and the previous close and the true low is the minimum of today's low and the previous day's close. The True Range Oscillator plots the oscillation of the Volatility Ratio in search of Wide Ranging days. A Wide Ranging day is defined as a day when the Volatility Ratio exceeds 2. Wide Ranging days signal an impending change in trend. Note that this occurs rarely. In our our selected chart of the Dow Industrials we find a Wide Ranging day at the beginning of a powerful up move (see arrow). The rare occurrence of Wide Ranging days is one of the best features of the True Range Oscillator. Personal Hotline, our flagship product, and HotlineX, automatically check this indicator once per day and alert you when a Wide Ranging day occurs. 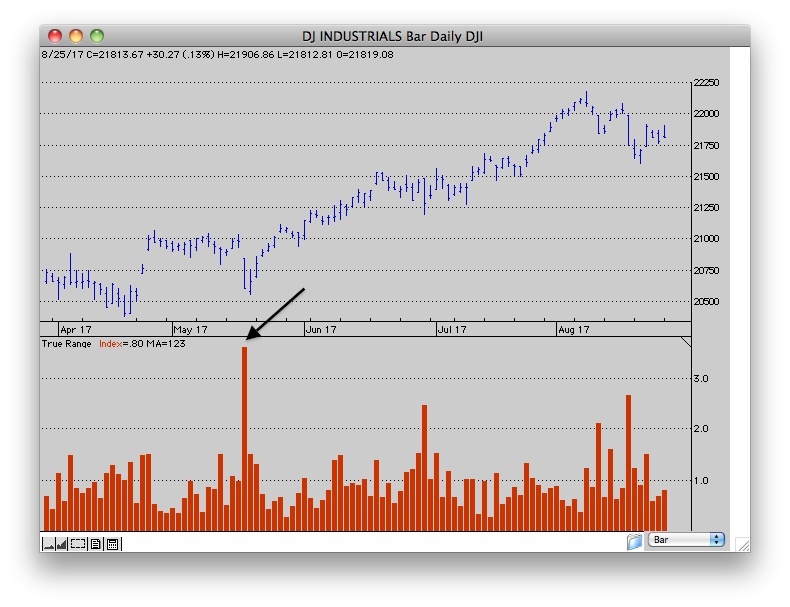 Note clear buy signal in mid-May.